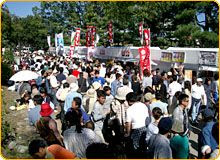 The Hiroshima Food Festival will be held around Hiroshima castle on October 27th and 28th. It is a 15min walk from J-hoppers Hiroshima. kagura (shinto music and dance numbers) plays will also be presented on the 27th (for free). It will be the 3rd time this festival will be held. The event is highly successful,attracting more than 700thousand visitors from Hiroshima and other prefectures every time. You can find and buy many kinds of agricultural and marine products of Hiroshima,and have a photo taken with a SAMURAI (not real) and Hiroshima castle in the back ground! !